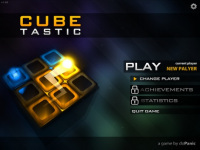 Cubetastic uses the rubik's cube as its game central tool. The shape consists of structural cells that form a 3D cube which you can rotate the cells vertically or horizontally. Provided around the cube, there is a starting point and a destination point and several colored cells. The main mission is arrange all cells in such a way so that the starting point gets connected to the destination point with the colored cells as the links. Cubetastic is a very challenging logic game for thinking hard. If you like playing rubik's cube, then you could be a fan of this game.